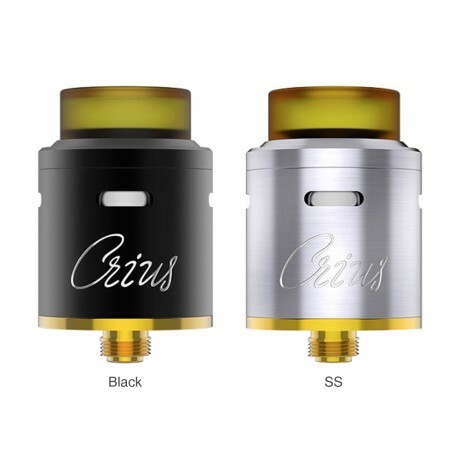 Today we introduce you the new Crius RDA from OBS, a revolutionary dual coils rebuildable drip tank with 24mm diameter. Crius features an innovative high-tech DIY deck with a Zirconia white piece which is heat resistant, corrosion-resistant and anti-oxidant, high hardness, non-volatile and no pollution. It adopts the new 360° cyclic airflow system with 4 adjustable holes instead of 2 holes, greatly improving the flavor as well as producing bigger clouds. The included BF pin makes it compatible with most squonker mods. Moreover, together with easy top filling, PEI drip dip and detachable structure, OBS Crius will bring you an amazing dripping experience.